Glem and Moneta have teamed up again to produce videos that present Agnese’s recipes, to promote genuine Italian excellence! 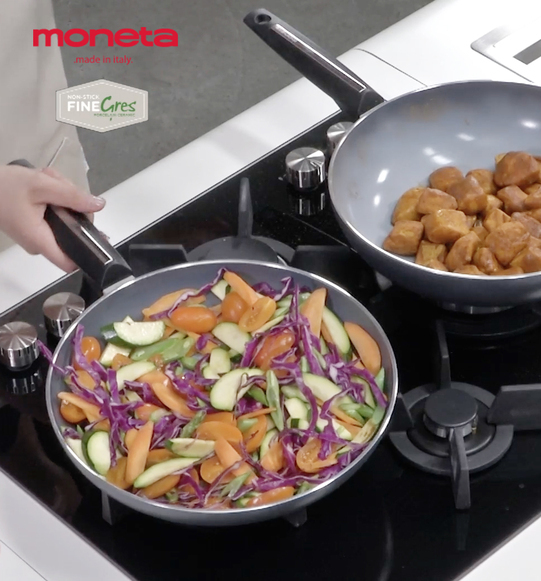 “Cucina con Agnese” (“Cook with Agnese”), the presentation of the new “Fine Gres” finish in a cooking trial with Moneta MonGres pans, featuring famous chef Agnese Gullotta. Agnese Gullotta is one of the most attractive personalities to emerge from the second season of MasterChef Italia TV series. At just 23 years of age, she revealed an amazing culinary talent and lots of determination, with all the freshness of spirit of a young woman whose life revolves around her studies and cooking. This cooking trial illustrates the fantastic qualities of the new Moneta Fine Gres finish on the MonGres pans. Central to the trial was the work of a Glem Gas crystal gas hob, which responded precisely to the chef's demands in all situations. So these are certainly the very best pans, but they can only give of their best on an efficient, top quality hob.